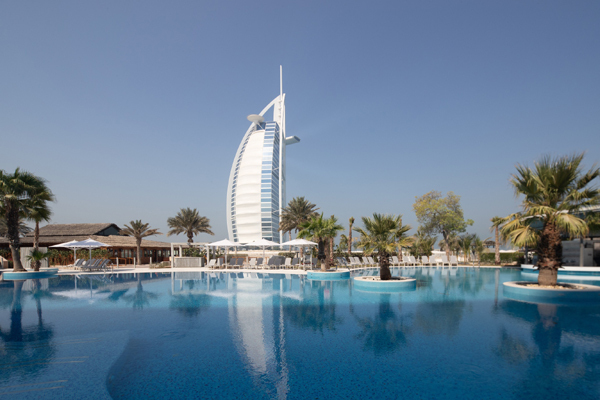 Jumeirah Group has announced that its much loved Dubai landmark, Jumeirah Beach Hotel, is to re-open on October 19, following a five-month transformation programme. Guests will return to discover a reimagined luxury experience created for the modern family and discerning traveller. The tasteful yet bold refurbishment was skillfully crafted to ensure no interference with the heart of the hotel, and mindful not to erase any of the warmth or personal touches synonymous with the Jumeirah Beach Hotel. The new Jumeirah Beach Hotel returns with a more contemporary ambience and a host of new dining experiences, retaining its family-friendly focus and redesigned rooms and suites for a more engaging, comfortable and yet pampering stay, all underpinned by Jumeirah’s award-winning, thoughtful and generous service. Welcome to a new look: The refurbishment has been inspired by Jumeirah Beach Hotel’s location – the sea, the sand and the iconic hallowing sail. The result is a space that is contemporary yet warm and welcoming, with white, gold and blue accents throughout sharing a seamless connection with nature. Welcome to a new arrival: From the moment guests arrive into a much lighter and airy lobby atrium, offering alluring views of the iconic Burj Al Arab, the interior design evokes moments of the sea: silhouettes of clouds receding into the water, rock formations, hues of both shallow waters and the warmer tones of the sea’s depth. High above the lobby hang three kinetic art installations, recreating the movements of underwater flora, the glistening of light on water, and the glow of the sun. Welcome to your stay: Rooms and suites, all with stunning views of the Burj Al Arab, elicit the calmness and serenity of the Arabian Gulf: laidback yet both sophisticated and functional, with subtle tones of blues and beige: the beach and waters. Guests will wake up beautifully following a rejuvenating night’s sleep in Hypnos beds that come with the seal of approval of Her Majesty, The Queen of England. Welcome to a world of dining: A mix of new and old dining concepts will return Jumeirah Beach Hotel to its previous status as one of the pillars of Dubai’s restaurant scene. The local community and the hotel’s loyal guests will settle back into favourites such as D&A, La Parilla and Uptown Bar, as well as Villa Beach, Beachcombers and Ocean Blue, into a trio of destination restaurants that celebrate and accentuate the hotel’s beachside location. At the heart of the hotel, our family dining hub Kitchen Connection invites guests to personalised dishes across nine interactive cooking stations for breakfast, lunch and dinner – as well as the legendary Friday Brunch - and Palm Court becomes Pearl Lounge, serving gourmet sandwiches, delicious tartines and a pearl inspired afternoon tea, both with captivating views of the Arabian Gulf and Burj Al Arab. Welcome to family time: The main family leisure pool will continue to take centre stage with an expanded swim-up bar. Children will enjoy the new Kids Club inspired by the underwater world, and all guests continue to have unlimited access to Wild Wadi Waterpark.